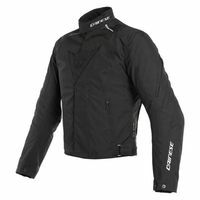 The Dainese Laguna Seca 3 D-Dry Jacket is a sporty, yet subdued jacket with classic lines. The demon logo on the chest makes the latest iteration of the Laguna Seca D-Dry Jacket unmistakably Dainese. Heavy duty Cordura fabric resists abrasion. D-Dry waterproofing keeps out rain while still allowing the jacket to breathe. Zippered air inlets on the sleeves with an outlet vent on the back help moderate your body temperature. A removable thermal liner holds in heat when you need extra insulation. CE rated armor at the elbows and shoulders keep you protected from impacts in the event of a crash.